Here's one cool Hot Rod we just got in on trade from a repeat customer of ours. 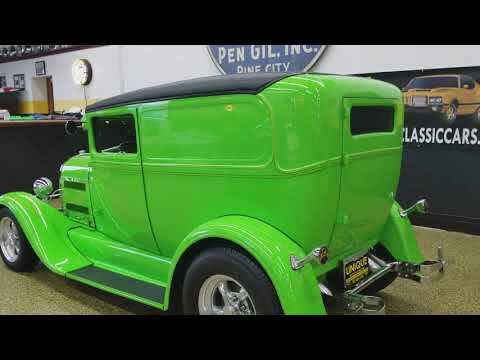 Take a look at this sweetie, 1929 Ford Model A 2 door Sedan Delivery, you won't see a lot of these around. This one is built on a TCI custom chassis and suspension and consist of steel body and glass boards and fenders. Powered by a small block 350 Chevrolet engine paired with a 4-speed muncie manual transmission and 9 inch rearend. The It has a chrome front axle with drop spindles and disc brakes for improved stopping power. The rear adjustables coil overs will help you tailor the ride that you prefer and the dual tanks will help you get further between fill ups. It's been driven 13,261 miles since it's build and is being sold with a clear Minnesota title. The interior has been finished off nicely with gray cloth and bucket seats and with the length of the seat tracks in this car even our taller employees can get in and drive it. It also comes with a tilt wheel, power antenna and Alpine stereo. This is one classic street rod that will be a blast to own, cruise with and show, call Jay, Jeff or Landon at 507-386-1726 or email "sales@uniquemankato.com" ALL TRADES AND REASONABLE OFFERS WILL BE CONSIDERED....FINANCING IS AVAILABLE.